What Does the National Monument or Park Designation Really Mean? The recent election has called a lot of attention to the concept of national parks and national monuments. The latter has also brought the use of the Antiquities Act into question. However, the creation of a national monument or park in the name of protection is akin to protecting the tree from the lumberjack in favor of the Pine Beetle. Former president Obama created a few monuments just before he left office. The move has environmentalists from around the world cheering, but states rights activists in the west are screaming foul. Frontrunner in this fight is outdoor mecca, Utah. Utah has had a contentious relationship with the federal government over lands protected by the National Monument designation. This conflict began in 1996 with the creation of the Escalante Grand Staircase National Monument. The decision was not popular with the residents in the area and any economic benefit they received isn’t enough to change their thinking. Now 20 years later, the same arguments are being made in the same scenario. It’s a classic case of history repeating itself. To really understand this argument, we really have to answer the following question: What does declaring a national park or national monument really do? The simple answer is: Marketing. Marketing is the only benefit public lands receive from becoming a national monument or national park. Prior to the creation of national areas, the amount of people that visit them is limited. People don’t know about them, and what they don’t know about, they won’t visit. Traditionally the argument for using the Antiquities Act to create national monuments, is to protect the land and allow equal access for all. However, the argument needs to be rephrased to say ‘prevent resource development and generate revenue from access’. In very few cases, does the ‘national’ designation increase protection and it usually restricts access. The protection idea is actually favoring one type of destruction over another. Proponents for national monuments say that we need the designation to protect the lands from resource development. Mines cannot be opened, and oil wells cannot be drilled in areas that are designated as a national monument or national park. This is definitely a valid argument. However, the reasons against resource development usually fall into one of these 3 categories: Mineral development will ruin the land, will preserve access for the public, and people will not want to see signs of development. Unfortunately, one of the side effects of mineral development is the occasional accident that does leave scars. Some scars last longer than others and in the event of oil, they can last significantly longer. Oil spills are drastic in that they can harm wildlife also. These are very legitimate concerns. However, ruining of land is not exclusive to mineral development, nor is the harming of wildlife. -In 2016 Casey Nocket, from upstate New York, was banned from all national parks for vandalism after a 26 day road trip in 2014. During September and October of 2014, Casey Nocket left graffiti at 7 different national parks. -Earlier in 2016, two people spray painted “Evans 16” on a rock overlooking the Grand Canyon, not very far from a visitor’s museum. -In January of 2017, 3 Canadians walked on sensitive hot springs in Yellowstone National Park and committed more crimes in other national parks across the western half of the United States. -Also in Yellowstone, a bison calf had to be euthanized, because some tourists put it in the back of their car and drove it to a ranger station. -In Death Valley, three men trespassed Devils Hole, and swam in the geothermal pool. Either by accident or intentionally, they killed an extremely rare pupfish that is near extinction. -By the Escalante land bridge in Escalante National Monument, there is an abundance of graffiti and markings on top of petroglyphs. Almost all of this is post 1996, the year it became a national monument. There are two things that giving something a National Designation does: It makes something a higher value target and it increases the amount of people who want to leave their ‘imprint’ on that target . Even though mineral development has the potential to ruin the land, mineral companies don’t want to lose money through oil spills or other accidents. Many people go to the national areas with the intent to leave their mark, and with the intent to vandalize and destroy. The very presence of people in these places is the enemy of preservation. This is why only so many people are allowed to backpack rim to rim in the Grand Canyon, or backpack the Zion Narrows. The sum of damage from all the small moving parts, which spread out over a large area, is greater than stationary and isolated areas used for mineral development. This is another fallacy of the pro ‘national’ designation crowd. Increased access does not always increase the amount of people in an area. Increased awareness and marketing of the area does increase the amount of access to an area. The area that is currently Bears Ears National Monument has always been accessible to the people. People have been recreating in that area for years, using roads that were built by cattle ranchers and mineral development companies. They have never been restricted. Had this area been a national monument before the mineral companies and ranchers developed the roads, they never would have been developed and access to these areas would only be available by the most advanced outdoorsmen. Many activities in national monuments require a permit, or limit the number of people or require an entrance fee. All of these steps decrease access, something that was not a problem before lands were seized to become a national monument. Fees do help pay for upkeep and maintenance, but these are things that are only needed because of the increase in visitors due to more marketing. With several national parks considering an entrance hike to $70 from the $25 price range, the preserved access is becoming more of a benefit for the wealthy and not the everyday family. Combine the fact that Zion has closed almost all free camping areas next to the park, forcing people to pay for camping or expensive nearby resorts. 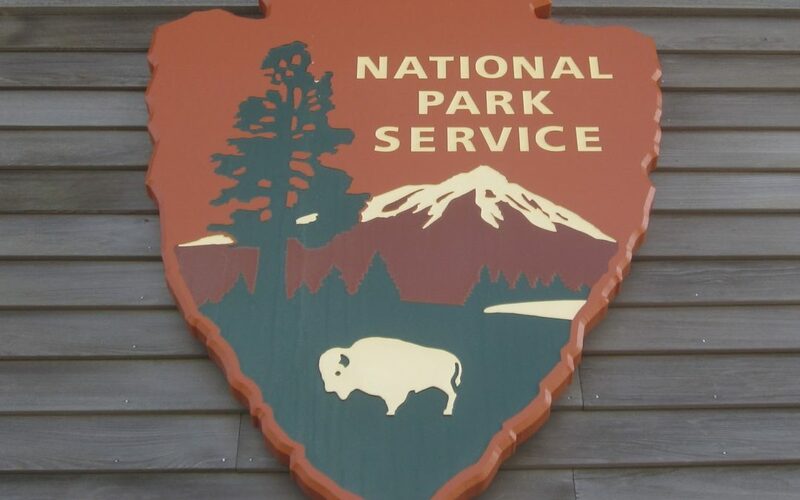 These increases costs also make visiting national parks prohibitive for poorer segments of the population, something most state and BLM lands don’t do. The slaving oil-well is when most people draw the line when it comes to mixing natural settings and human development. I offer two pictures for your comparison. One is an unknown picture of immense beauty and another is a picture that looks similar to the Los Angeles freeway around 5 p.m.
To some, the long line of cars and people is far uglier than the monotonous oil well. The beautiful pictures we see of national parks are often carefully staged, orchestrated-marketing ploys. Photographers often arrive early or late, because the perfect picture to them is car-and-people free, something that becomes far less likely when a plot of land moves from state or private hands to federal hands. The federal government is well aware of this and carefully selects people-free pictures for most of their marketing campaigns, all the while encouraging access for profit. We turn a condemning eye to the natural resource companies who build many of the roads we travel on in order to get to these locations. We pump their product into our SUV’s and complain about the prices while we do it. All the while, we tell them they are public lands for everyone except the companies who provide the resources we need. We punish and restrict the big burly lumberjack from one tree and turn the beetles loose on the entire forest. The damage is still being done. The true solution is to stop publishing the information and making it possible for people to locate any of these areas. This is not a practical antidote to the sickness. However, it just may prevent some people from discovering the hidden treasures that haven’t been spoiled by people wanting to leave their mark. It’s time we recognize that people are the real disease and allowing more access is encouraging the cancer. The outdoor community is part of the cancer, but they don’t want to admit it. We don’t like to accept our part of the problem. Our boots walking the same paths as thousands of others, cause environmental harm. Oil wells run dry and can be capped. Every footstep leads to erosion, that is only repaired by taking soil from somewhere else, causing erosion somewhere else. Family vacations to national areas are reserved and enjoyed by middle and upper class Americans. The national designation does nothing for the single struggling mother in Chicago, or underpaid Wal-Mart greeter in Portland. Mineral development benefits everyone. Everyone benefits from lower gas prices. It’s time for the outdoor industry to work with mineral-development companies to make spill clean-up more efficient, and decrease the chance of oil spills. Stop marketing to the masses who don’t respect the land and let the ones who do discover it through research and not tourist pamphlets. However, the outdoor industry won’t do that, because less national park marketing, is bad for their business. Just like more national parks are bad for anyone who drives a car. Which side you are on depends on your own personal benefit. You choose your side for greed–not for protecting access or the environment.